Line Voltage or Low Voltage - What's the Difference? 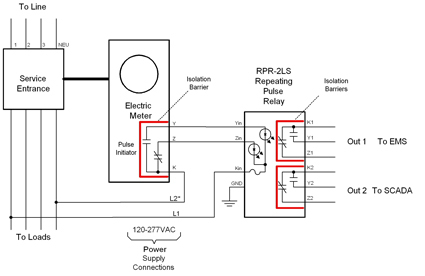 We often get calls and emails from metering professionals who use pulse isolation relays and wonder about the differences between what we call “line voltage” or “low voltage” isolation relays. Both provide protection for the meter, but how much protection and how they function is really the deciding factor for which one to use. A line voltage relay is an isolation relay that uses line voltage as the wetting voltage to operate the input of the pulse isolation relay. This means that electricity is flowing from the electrical service through the electric meter to operate the KYZ switch components, and then continues to flow through the isolation relay powering the relay and its KYZ switches. In the figure below you see a schematic of the line voltage input circuit. Some people call this type of relay “self-powered”. Line voltage, normally of either 120VAC or 277VAC, is routed to the K terminal of the isolation relay, the Y and Z terminals of the isolation relay are connected to the Y and Z terminals of the meter, respectively. Finally, the K terminal of the meter returns to neutral or ground, or in some cases to the other voltage phase if operating phase to phase. Although this can be a little confusing, the main area to note is that 120VAC is flowing through both the electric meter and isolation relay to operate the KYZ switch components. The main advantage of using line voltage relays is simplicity in design which leads to a lower cost. However, this simplicity can also be a disadvantage. Since the KYZ switch components in the meter and the relay are being powered directly from the electrical service, an additional dielectric barrier is sacrificed. Any transients that occur on the power line are directly “seen” by the pulse output of the electric meter and can even cause damage to the meter. When using line voltage relays, you also need to know how much voltage input the meter can accept for its KYZ switch components. Various electrical components used in meters such as an open-collector NPN transistor, open drain FET, some reed relays, and some mechanical switches may be unable to handle 120VAC. For this reason, it is very important to verify meter voltage inputs before using a line voltage relay. Conversely, low voltage relays are powered by the electrical service but incorporate a transformer-isolated power supply that generates an isolated +12VDC or +13VDC supply voltage. This means that the +13VDC supply voltage is utilized as a wetting voltage for the meter’s output instead of the 120VAC electrical service. This configuration generally connects to the meter as shown in the figure below. As you can see, the 120VAC supplied by the electrical service connects directly to the relay. From there, the relay’s transformer reduces the 120VAC to a more regulated +13VDC to the power supply, which then operates as the wetting voltage for the meter. 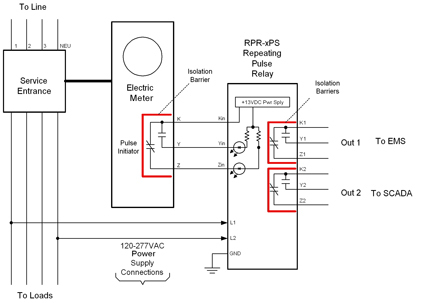 There are several advantages to using a Low Voltage relay. The first being, that a low voltage relay’s configuration is more universally compatible with various types of electric meters. This is due to the reduction of 120VAC as the wetting voltage. As mentioned above, several types of dry-contact outputs of an electric meter need a lower input voltage. +13VDC can be used with almost any switch component out there. Another advantage is the addition of a dielectric barrier. By sending the electrical service through the isolation relay’s transformer first, any transient damage is prevented from directly entering the meter. With the low voltage configuration, the meter is protected by the isolation relay from all directions. The one disadvantage of low voltage relays is the slightly higher cost. Due to the more sophisticated and regulated design provided by the transformer and wetting voltage, a low voltage relay does have a small increase in price. However, it’s certainly a small price to pay for the additional protection and universal compatibility it provides. Solid State Instruments provides a wide variety of both Line Voltage and Low Voltage relays*. Contact us today for more information on which relay is right for you! *Update 1/8/14: Due to shifts in industry demands, we are no longer manufacturing Line Voltage Relays. Support documents for our RPR-xLS Series are still available in the Legacy Products section of our Documentation page, and we can still provide technical assistance for existing RPR-xLS relays over the phone.